A member of the Sackler family that owns OxyContin’s maker directed the company to put a premium on selling high dosages of its potentially addicting painkillers, according to new disclosures in a lawsuit. Richard Sackler, a son of a founder of Purdue Pharma and its onetime president, told company officials in 2008 to “measure our performance by Rx’s by strength, giving higher measures to higher strengths,” according to an email written by Mr. Sackler, contained in the filing. The lawsuit, which was filed last June by the Massachusetts attorney general, Maura Healey, claims that Purdue Pharma and members of the Sackler family knew that putting patients on high dosages of OxyContin for long periods increased the risks of serious side effects, including addiction. Nonetheless, they promoted higher dosages because stronger pain pills brought the company and the Sacklers the most profit, the lawsuit has charged. Purdue Pharma has long denied that it engaged in such a marketing strategy, and Richard Sackler has stated that he was not involved in the company’s marketing activities. However, the 2008 email appears to be among the first internal company emails to indicate that Mr. Sackler urged the promotion of higher strengths of OxyContin. Two other members of the family, Jonathan and Mortimer Sackler, were copied in on the email, according to the new disclosures. That email is one of several disclosures that emerged Thursday when Ms. Healey filed a version of her lawsuit that contained information that Purdue Pharma had sought to block from public view. In a filing last week, several parts of the lawsuit were redacted, but a Massachusetts state judge agreed with several groups, including The New York Times and other media organizations, that the entire complaint should be made public. A last-minute effort Thursday by Purdue Pharma to block the release failed. The drug maker has long sought to depict the Sackler family as removed from the company’s day-to-day operations. The Sacklers are one of the richest families in the United States, with much of their wealth derived from sales of OxyContin. Their name graces museums and medical schools around the world, and the new revelations are likely to renew calls for institutions to decline their philanthropic gifts. Earlier this month, it had described the lawsuit as “littered with biases and inaccurate characterizations.” That statement said the company was working to curtail the use and misuse of prescription painkillers. In 2007, Purdue Pharma pleaded guilty to federal criminal charges that the company had misrepresented the dangers of OxyContin. Three of its top officials — its chief executive, Michael Friedman, its general counsel, Howard Udell and its top medical officer, Dr. Paul Goldenheim — pleaded guilty to criminal misdemeanors associated with the company’s conduct. Together, the company and the men paid $634.5 million in fines. At that time, the Sacklers were not accused of any wrongdoing and have not faced personal legal consequences over the drug. The new disclosures show that after the pleas, the Purdue board, which includes several Sackler family members, voted to pay Mr. Friedman $3 million and Mr. Udell up to $6 million. The lawsuit contends the payments were efforts by the Sacklers to maintain the executives’ loyalty and protect the family. Mr. Udell is now deceased and Mr. Friedman did not return a telephone call seeking comment. The new disclosures also include a chart showing the billions of dollars the Sacklers have received from Purdue over the years. 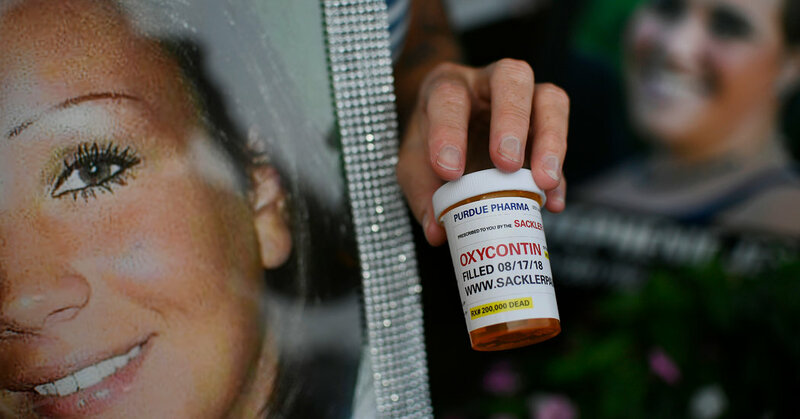 The lawsuit alleges that the Sackler family received more than $4 billion in opioid profits since 2007, when the company pleaded guilty. The lawsuit includes claims that McKinsey & Company, a consulting firm, prepared reports for Purdue Pharma to develop strategies that would increase the prescribing by doctors of the more powerful forms of the company’s painkillers. According to the complaint, McKinsey consultants advised Purdue Pharma to increase sales by claiming that opioids reduced stress and made patients less isolated. Patients on drugs such as OxyContin can in fact become socially withdrawn. McKinsey consultants, members of the Sackler family were told, also planned to study techniques for keeping patients on opioids longer and McKinsey urged Purdue Pharma to fight efforts taken by federal agencies to stop illegal drug sales, the lawsuit claims. Reached Thursday evening, a spokesman for McKinsey had no immediate comment. The filing also shows that in recent years Purdue Pharma considered selling drugs used to treat opioid addiction or counteract the effects of a potentially fatal opioid overdose. While that plan did not go forward, the company also considered the possibility of selling naloxone, or Narcan, which is a drug given to revive people suffering an opioid overdose. According to documents cited in the filing, a potential marketing plan called for studying “long-term script users” to “better understand target end-patients” for Narcan. Since OxyContin came on the market in 1996, more than 200,000 people have died in the United States from overdoses involving prescription opioids, and Purdue Pharma has been the target of numerous lawsuits. The Massachusetts case is one of hundreds of lawsuits filed by states, cities and Native American tribes against manufacturers and distributors of opioids. Many of those case have been consolidated for trial in an Ohio federal court. Next PostNext Trilobites: You Flushed the Toilet. They Made Some Bricks.